The 3-star Apartahotel First Flatotel International in Benalmadena Costa is a popular complex suited to families, couples and friends longing for a memorable holiday in the sun. 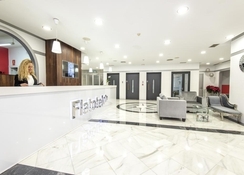 With an abundance of activities for all ages, days out, shops, vibrant bars and fabulous restaurants right on its door step, the Apartahotel First Flatotel International makes for a great base on your Spain holidays. The hotel overlooks the beach meaning it’s just a few steps away for you to dip your toes in the glorious Mediterranean Sea or bask in the sun on the sand – that’s if you ever tire of the resort swimming pool and two new children’s pools, or the swanky solarium! The well-appointed rooms (with options sleeping up to 8 people) are modern, spacious and tasteful and also include free Wi-Fi that’s available throughout the hotel for your convenience. 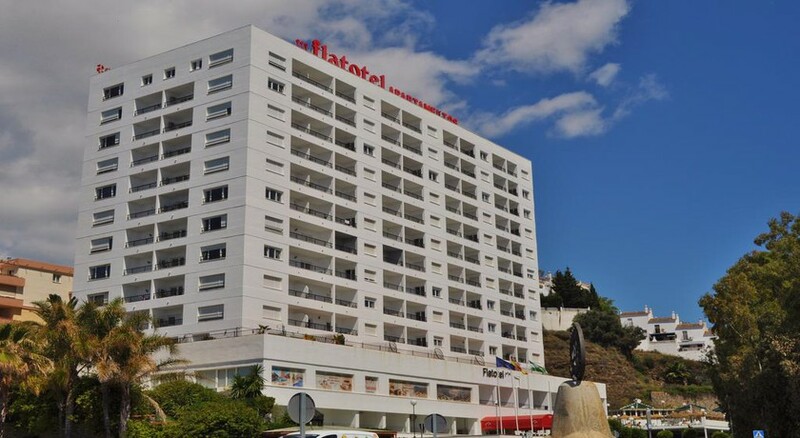 Nestled a few steps from the beach in Benalmadena Costa, the Apartahotel First Flatotel International is just a 15-minute drive from Malaga Airport, meaning you can get your holiday started right away! 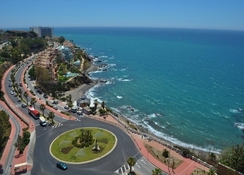 The Torrequebrada Golf Course is next to the hotel and the casino is also within close proximity. Catch a bus from the bus stop directly outside the hotel which runs every 15 minutes to explore the local area and visit the nearby vibrant bars, shops and high-end restaurants. The 108 air-conditioned rooms in the Apartahotel First Flatotel International include a mix of Double and Studio Rooms, 1, 2, and 3 Bedroom Apartments (sleeping up to 8 guests) and the luxurious Presidential Executive Suite. There are also some apartments adapted for the use of disabled persons and cots are available to hire for any room. The well-equipped apartments are light and airy thanks to the large windows and all feature a living room separate from the bedrooms, balcony, kitchen, TV, bathroom (1 for each bedroom), modern tiled floors, air con and heating. All rooms have beautiful partial sea views out across the Mediterranean Sea. Satisfy your palate with international meals served at the exclusive on-site hotel buffet restaurant and lounge bar, or quench your thirst with a cool, refreshing drink at the poolside bar. A supermarket is available within the hotel for necessities. There’s plenty to do at the Apartahotel First Flatotel International with a swimming pool and large sun terrace with sun loungers and parasols, as well as two children’s pools and if that’s not enough to keep the little ones entertained there’s a bright and colourful children’s play area too! There is a free, well-equipped gym for guests to use and a games room for less intensive activities. Bikes are available to hire and make for a great way to get out and about in the local area or book onto an excursion for a fantastic day out! Pets are allowed in apartments only. Lovely spacious clean apartment. Great views over the sea. The only thing that let it down was it’s location & there was nothing to do in the evenings (couldn’t even find English Channel on TV). Great value for money though. Right on the beach but a fair walk into the town, however there is a regular bus service. Our October half term trip. We were really happy with flatotel. It was clean , spacious and a very good size apartment. My boys suffer from peanut allergy, the staff were really helpful. They showed us exactly what the boys could eat and not eat. It's a good location and admin booked us tickets for various shows. They also explained to us about busses and places we could visit. Great apartment, right on front with bus stop into centre! Pool area lovely with small bar and good selection for breakfast. Ideal for friends wanting to share ! Right next to a Golf course. Great area to explore by local bus, cheap and easy! Would definitely recommend. 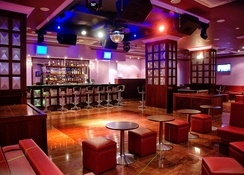 Very helpful and friendly staff.food great and nice relaxed bar off the foyer.pool and outside bar were up to standard. Good value for money for what we paid. Basic but clean accommodation with big rooms. Any problems were sorted out straight away such as our shutter blinds not working. Friendly staff and nice little cafe bar where we could buy snacks. A little way out of central benalmedena but lovely views to the sea. We didn’t really use any facilities but it looked like everything was there in the kitchen if you needed it. rooms ok ,but needs updating the staff were friendly, rooms cleaned each day, bus stop just outside of the hotel. 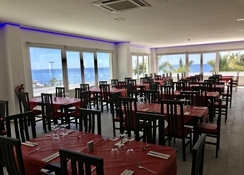 Not many restaurants in the area, nice beach, overall you get what you pay for.